A part of Indonesia was a Dutch colony until 1945. After the second World War ended, and Holland had to give up Indonesia, many inhabitants of Indonesia used their Dutch passport to come and live in Holland. Although they spoke the language, which they were forced to learn at school in Indonesia, these people were strangers in Holland. And they were not always given a warm welcome here, to say the least. One of the many good things these people brought to Holland was music. In Indonesia there were a few styles of traditional music, like Krontjong, and these styles of music were also played in Holland. 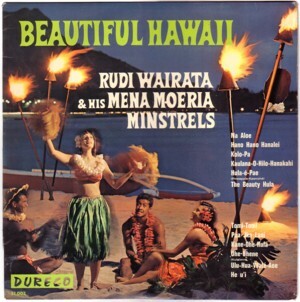 But for complete mysterious reasons many of these people started playing Hawaiian music in their new mother country. I am not a musicologist and most of what I know from the social backgrounds of this phenomenon is from comics, so I am not going to try and explain it. I just love the music! The second generation of the musicians who moved from Indonesia to Holland in the 40?s, is much better known the first. They were the so-called Indo-rockers. I will write about Indo-rock too in a future episode of this Soundtrack, but since these girls and boys learned to play from their parents, the music of the first generation has always fascinated me. 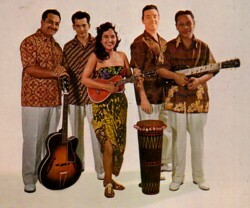 Almost all of their music that has been recorded, seems to be made for the Dutch market: a commercial mix of traditional Indonesian songs and Hawaiian music. And often there are also influences from American rock’n’roll music. There is something that I love about this music, not in the least because the combination of Indonesia and Hawaii it is so weird. For many years these Indo-Hawaiian records were very easy to find, unlike the Indo-rock records, who have been extremely rare from the beginning. Here is a scratchy 45 that I was lucky to find and which I have never seen again. 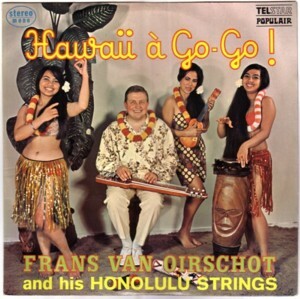 It has all the ingredients that I love in this strange Dutch-Indo-Hawaiian-USA cross-over music. The singer and guitar player is Rudy Wairata, who was responsible for many more of this pre-Indorock tunes.